It’s the first-ever Boston sporting event with zero upside. Name one result that would make Patriots fans feel fantastic afterwards. For example, let’s say the Patriots win by 35, with Brady finishing 34-for-35 for 450 yards and 6 TDs. What does that mean? So the no. 1 seed Patriots took care of business at home, after a bye week, by blowing out a .500 team featuring a QB who can’t throw a 10-yard out, an overworked running back who’s running on fumes and three above-average defensive players (and they’re six days removed from one of the most emotional victories in recent football history, no less)? Can you really celebrate that? Meanwhile, any other result is a potential heart attack … or worse. That’s why most Patriots fans are a nervous wreck heading into a game in which their team is favored by 13½ points and playing a team it already crushed. Has that ever happened before? Even if Super Bowl XLII will always be the worst defeat in the history of the franchise, this particular loss would be more excruciating because we can see it coming … even though, again, losing this game makes absolutely no sense. So here’s the thing. Tom Brady is, by far, the best quarterback playing right now. It’s easy to forget that, with the modeling, the formerly flowing locks, and the Brazilian supermodel wife. Get him on a football field, though, and he’s truly in his element. So…what happened when perfect Brady met the seemingly-touched-by-the-divine Tebow? Annihilation. Eerily close to Simmons’ best-case scenario, Brady threw for 363 yards and 6 touchdowns, and the Patriots won, 45-10. But what interests us is Simmons’ (and others’) acknowledgment that, for Brady, everything hung on this game. He “had” to win this one, in order to validate is glorious stature, but, at the same time, winning was just the thing he was supposed to do. A classic no-win situation. Martin Luther famously said that “the quest for glory cannot be satisfied…only extinguished.” Tom Brady knows what that feels like. Had Brady retired before this season, he would have been a first-ballot Hall of Famer and a necessary mention in any Greatest Quarterbacks of All Time discussion. Once he suited up against Tebow last weekend, however, he had to win to maintain the glory that he had achieved. Lose, and you’re just another broken corpse in the rubble left behind by the Tebow juggernaut. Win, and…well, that’s what you were supposed to do; you were favored by almost two touchdowns! Win, and move on to the next game in which all of your accumulated glory is at stake. Little wonder that Todd Marinovich gave it all up. We Christians know this feeling, too. There is no quiet time long enough, no WorldVision donation generous enough, no act of devotion passionate enough to quell our fear that God’s demand remains unsated. And the tremendously unsettling truth is that God’s demand is unsated. Jesus claimed the the requirement was nothing short of actual and literal perfection (Matthew 5:48). Tom Brady, why didn’t you throw for 7 touchdowns? How do you account for the eight out of thirty-six passes that fell incomplete? 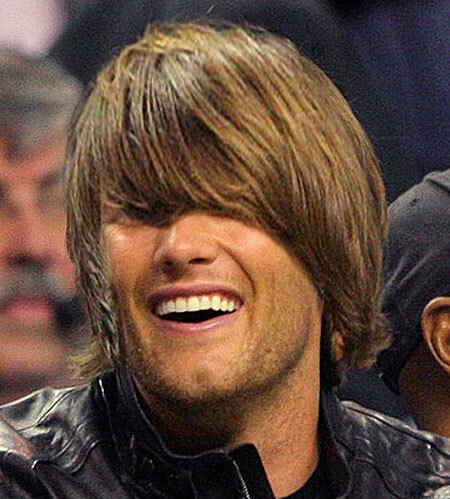 Tom Brady, you’d better beat the Ravens this weekend, or we’ll forget all about your wonderful (but not perfect!) performance on Saturday night. You have to remember, though, that Boston is a special case. This is really about the Red Sox…. The demands of the law (pefection) are relentless. Only when we are raised, for the last time, are those demands put to an end…for good. But now…we have His promises and that is enough. Brady is very good and discipline in his style…the sad thing about his countenance is the lack of ease, fun, pleasure, joy in his disposition….it is as if he has to prove himself, or his dad, for what I know about such drive…It reminds me of Harold Abrahams in Chariots of Fire when he expressed his modus operandum, namely: I have 60 seconds to prove my existence. The sad reality is that most Christians live as such not feeling at all that Jesus already performed perfectly for them….how do you think I have felt most of my life?….If I am remotely close to the kernel of the truth…most Christians don’t understand the good news…we think we do…if we did…O my God! By the way, in my opinion, Chariots of Fire had nothing to do with the Good News; it was all about Eric’s morality…I think the Law had the major function in that movie….and the selfrighteousness of Eric’s sister is scubala (check the greek)…and all Christians eat that movie as a champion of the gospel. I did not like it one bit….my guts told me so…or Someone else. By the way, if you have not noticed, I am self righteous about the self righteous ones.